I wanted to Tweet this great article from the Wall Street Journal, but you have to be a subscriber to view in its entirety. I’m posting here instead. 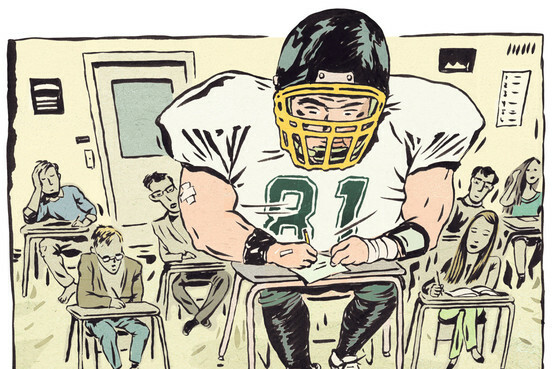 Interesting debate on MBAs catering to athletes. I vote against! Apply like the rest of us and benefit from a class of diverse backgrounds. In one of the latest incarnations of a business-school degree program, George Washington University’s School of Business this summer launched a two-year executive M.B.A. program that caters to the busy schedules of athletes and others in the public eye. Business schools are growing increasingly creative in their offerings as they look to offset declining interest in traditional M.B.A. programs, focusing efforts on one-year programs for recent graduates, international partnerships and, in the case of George Washington, degrees for individuals in niche fields like professional football. To be sure, George Washington isn’t the first to cater to athletes: Harvard Business School, University of Pennsylvania’s Wharton School and others have long offered dedicated programs geared toward football players through courses sponsored by the National Football League. But those courses, on topics like real estate and entrepreneurship, last only a few days and don’t lead to a degree. George Washington’s STAR—”special talent, access and responsibility”—program is possibly the first general business degree program for such a specialized group. Business-skills classes can be particularly valuable for professional athletes, who often find themselves out of work—and out of money—by the time they hit age 30. But some wonder whether the program perpetuates the assumption that athletes cannot also be academics. Sanjay Rupani, chief strategy officer at George Washington’s business school, says the specialized program is needed to help the professional athletes translate “their special talents,” as many look to market themselves via entrepreneurial endeavors. The STAR program’s 22-student roster includes Baltimore Ravens linebacker Brendon Ayanbadejo, former gymnast and Olympic gold-medalist Dominique Dawes and professional poker player Michelle Lau. The curriculum is similar to the school’s regular executive M.B.A. curriculum, but STAR students don’t take classes with the other students. The classes focus on finance, marketing and global business and cover topics like negotiation and statistics. The STAR students meet as a group six times during the two-year program and complete some online coursework as well. The program costs a total of $95,000, the same as the school’s other executive M.B.A. But Douglas Guthrie, dean of the George Washington business school, says that speculation is “puzzling,” noting that the coming February class includes an NFL player who attended Cornell University as an undergraduate. “While it is surely true that some athletes are not prepared for graduate education, many are,” he says. George Washington’s Mr. Rupani says the application process is rigorous, weighing academic transcripts, personal statements and recommendations. Still, the current class had a 100% acceptance rate because all of the students presently enrolled were specifically invited to apply. It is too early to say whether other schools will follow George Washington’s lead. Right now, they are channeling professional athletes into their regular M.B.A. or executive M.B.A. tracks. University of Virginia’s Darden School of Business has former professional football and baseball players in its current full-time M.B.A. cohort, tapping the athlete market without making special considerations for them, like separating them from other students. Wharton’s Mr. Shropshire says it’s no secret that a major component of a business-school education is to network with a variety of students who can become valuable business contacts. But George Washington says the segregation actually adds value, putting the students at ease by surrounding them with others who may have been more focused on playbooks than on textbooks in recent years. “Our students get to network with other students who bring very similar experiences and perspectives to the table,” says Mr. Rupani. And being surrounded by athletes is exactly what some of the STAR students expect after graduation. Mr. Ayanbadejo, 35 years old, says he is looking to beef up his résumé before retiring from the NFL and applying to jobs as a university athletics director.